The Topper Winter National Regatta took place on the last weekend in February at the National Sailing Academy. The Topper is a single handed sailing dinghy (11 foot 43 kg (95 lb) ideally suited to Junior sailors and smaller adults. It enjoys the status of a British Youth Sailing Recognised Class and is recommended by the RYA for Junior (U16) sailors. 150 Sailors from National and Regional Squads participated from all corners of the UK. The conditions were incredible tough, as this was the weekend of ‘Storm Doris’! Saturday’s racing was cancelled due to conditions and Sunday racing started with an 8.15am launch to beat the worst of the weather front, that came in in the afternoon. Three THS students participated. 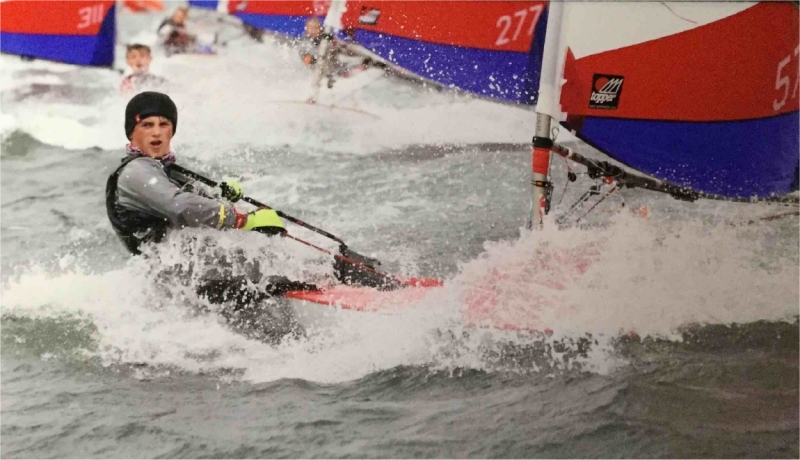 In the 5.3 Fleet – (Larger Sail) Will Adler of Year 10 (Stratford) came joint first, but was then given second place out of 135 sailors on a points technicality and Olli Fellows, also Year 10 (Stratford) came 29th out of 135. In the 4.2 Fleet (Smaller Sail) Ben Richardson of Year 9 (Trenchard) came 4th out of 35 Sailors. Congratulations to all three on amazing achievements in a very competitive sport.